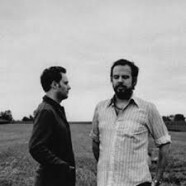 Any attempt to write about the music of A Winged Victory For The Sullen is to admit defeat. To concede that words are inadequate, a blunt and useless tool for conveying the power and beauty of the music they make. It is all too easy to reach for the stockpile of clichés in attempting to describe what they do because their music is affecting in a way that is not easily or readily analysed. The sense of wonder and mystery is at the very heart of what makes their wordless music so moving. 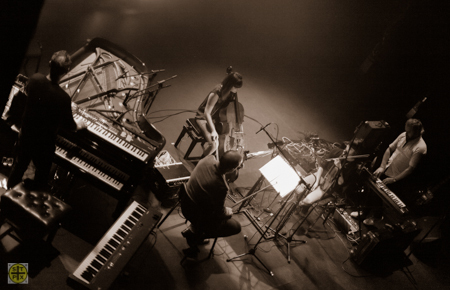 On Tuesday night at the Pavilion Theatre in Dun Laoghaire, A Winged Victory for the Sullen delivered a set of measured, quiet power that held the capacity audience spellbound for 70 minutes. Dustin O’ Halloran on piano and Adam Wiltzie on guitar/keyboards were joined by a string trio; the result was a sublimely gorgeous set that ebbed and flowed, a series of monumental swells and retreats into silence. At times, it was as if the audience had collectively stopped breathing; never has the phrase ‘you could have heard a pin drop’ been more apt. Opening with the monolithic ‘Atomos I’, O’Halloran and Wiltzie led us through a seamless fifty minutes of music encompassing tracks from their recently released second album. When they eventually stopped to come up for air, Wiltzie was moved to comment that the enthusiastic response sounded more like the response of a Whelan’s audience, no doubt harking back to previous visits to Dublin’s premier rock venue with Stars of the Lid and perhaps even Sparklehorse. On record, the quieter, ambient side of AWVFTS dominates; in a live setting it was surprising how much visceral power they generated during a series of stunning peaks and crescendos. Wiltzie’s stellar guitar interjections and keyboard drones maintain a loose connection with rock music while O’ Halloran’s sparingly beautiful piano lines and the string section’s sombre melancholy make for a heady concoction. After the break at the fifty minute mark, they played a track from their self-titled debut album and two more new pieces from Atomos; all delivered with the same measured grace, the same slowly shifting beauty. It was a privilege to witness such a special one off show by a band making such incredibly moving music; A Winged Victory for The Sullen: we are not worthy. It would be remiss of me not to mention the performance of Chequerboard, special guests on the night. ‘The Unfolding’ was one of the best Irish albums of 2013 and their 30 minute support slot showcased the dexterous guitar work of the hugely talented John Lambert who remains one of the most underrated artists on the Irish music scene. His beautiful acoustic finger picked instrumentals (reminiscent of Nick Drake and Vini Reilly of the Durutti Column) were embellished on the night by cello and electric guitar and the result was a typically sumptuous performance. For once, the term ‘special guests’ was truly accurate. Dream concert! Cinematic music.. Thank you for a wonderful melodic review Paul.